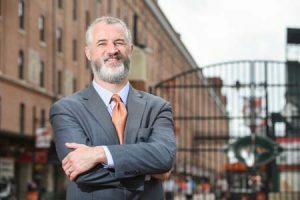 In the five years since becoming a principal at Kramon & Graham, Brian Southard has created a successful niche market representing national homebuilders in all aspects of their business in Maryland. Southard says it is his job to take on his clients’ legal issues, create solutions and implement organized processes to minimize risk and the recurrence of those issues so that his clients can continue focusing on the successful operation of their business. “Most of my clients are homebuilders – so I take pride in the fact that, in a small way, I am helping to build quality homes and communities throughout Maryland,” Southard said. He says persistence is the key to his success in law. In 2018, Southard was named one of The Best Lawyers in America by Real Estate Law. He has been named a rising star annually since 2011 by Maryland Super Lawyers. He also was a “Baltimore’s Finest 35-Under-35” honoree of the Maryland Chapter of the Cystic Fibrosis Foundation in 2011. He has been a board member for the Maryland Building Industry Association, Land Development Council since 2015. From 2008 to 2016, he served on the board of the Community Law Center. He earned his law degree in 2003 from the University of Maryland Francis King Carey School of Law and his master’s in business administration the same year from the University of Maryland Robert H. Smith School of Business.